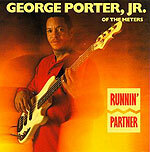 As bassist of New Orleans' premiere funk band, the Meters, George Porter Jr. helped create and define modern electric bass technique and style. His work in the 1960s and '70s influenced everything from contemporary blues, to Top 40 rock and fusion jazz. On his solo debut, Porter shows himself off as not only a premiere instrumentalist, but a top-flight vocalist and composer as well. Highlighting "Runnin' Partner" are two contributions by ace guitarist Earl King: "Rough Spots" and "Don't You Make Me Ig'nunt." King also sits in on these two cuts, which are given uptempo, funkified treatments by Porter. The rest of the album was written by Porter, and the material ranges from the light fun of "Happy Song" through the breezy George Bensonesque title track to the heavy funk of "Concentrate on Work" (in which the band segues from an Ohio Players-type groove into some thick blues organ by Ron Levy). Porter's strong vocals handle the varied range of songs with ease, although the lyrics are generally rather simplistic and overly repetitive. The tight horn section shines throughout, with a punch and energy that matches Porter's own. Although "Runnin' Partner" ends weakly with pop/jazz cuts "More BTU's" and "D.T.P." and the syrupy "I Wish," it is overall a strong album.